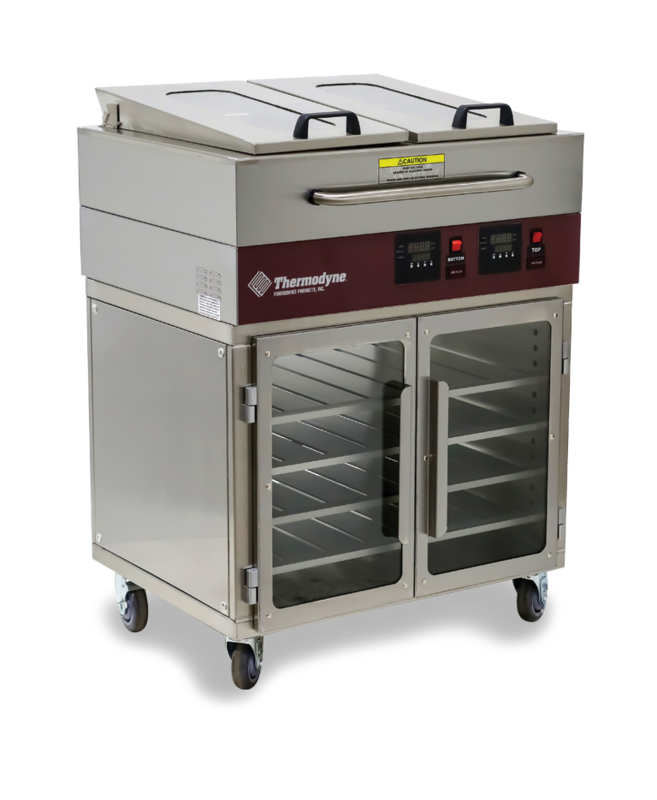 The 742HW unit, part of Thermodyne’s Hot Well Series, offers the convenience of steam table capabilities as well as the flexibility of Thermodyne’s patented Fluid Shelf Technology. Typical hot well steamers only allow the bottom portion of the unit to be used for simple storage purposes; the 742HW has the capacity for both food cooking and holding, all in one unit. Products can be heated and held for extended periods of time without cross flavoring or temperature fluctuations, all while utilizing the steam table. This allows for multiple products to be produced simultaneously, enabling a mixture of meats and vegetables that can enhance the variety of your menu. Fluid Shelf Technology, Thermodyne’s revolutionary heating method, is designed to continuously circulate heat throughout each shelf in the Holding Cabinet. With 100% distribution from top to bottom and left to right, each of our Commercial Food Warmers and Electric Food Warmers provides an exact and even temperature. With no circulating air and continuous heat, food can be held for extended periods of time without fear of over cooking or drying out. Additionally, with heat in the shelf rather than the air, food is protected from unstable environments such as door openings, hot spots, and additional air flow. With no risk of temperature fluctuation, kitchens enjoy reduced shrinkage and product waste as well as less energy consumption. At Thermodyne Foodservice Products Inc. we manufacture both countertop and full size hot food holding cabinets. Contact us today to find out the amazing flexibility and serving capabilities made possible by Fluid Shelf Technology.